In a major win for the development of Florida’s bicycle infrastructure, Governor Rick Scott has signed legislation that will significantly increase spending on bicycle and pedestrians trails. 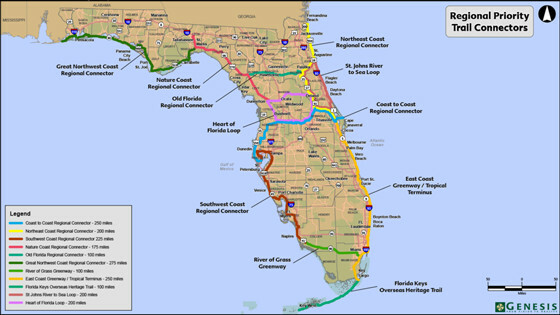 House Bill 2514-A requires the Department of Transportation to allocate $25 million per year to the Florida Shared-Use Nonmotorized Trail Network, or SunTrail. The SunTrail, an initiative backed by Senate President Andy Gardiner, will be a statewide network of biking and walking trails that are physically separated from roadways. Originally, lawmakers had proposed that $50 million be allocated to the SunTrail, with $25 million coming from an existing motor vehicle tax and $25 million coming from Amendment 1 sources. Amendment 1, which was passed by voters in 2014, requires that certain tax proceeds be directed towards land acquisition and land improvements on conservation lands. However, this area of funding proved to be a controversial issue during the budget process, an ultimately the $25 million allowance for the SunTrail was removed from the Amendment 1 package. The SunTrail has been an important priority for Senate President Andy Gardiner, who has been a major supporter of trail projects in recent years. In 2014, $15 million was allocated to the Coast to Coast Connector trail, another initiative backed by Senator Gardiner. These are significant contributions towards developing new trail systems, which will provide Floridians and tourists with safer riding options. I hope some of this money or another source goes to local trails, mapping out bike friendly road networks and conncetion bike paths or trails to support both city needs and to make the Florida state wide bike trail system like the coast to coast trail that more accessable and better utilized.